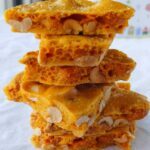 I first found this recipe for Microwave Peanut Brittle 4 years ago, and quite honestly, it’s fantastic. Alex and I are not peanut brittle lovers, but we sneak bites of this every day until I package it up. I’ve made batches and batches of it ever since to include in my Christmas food gift packages. 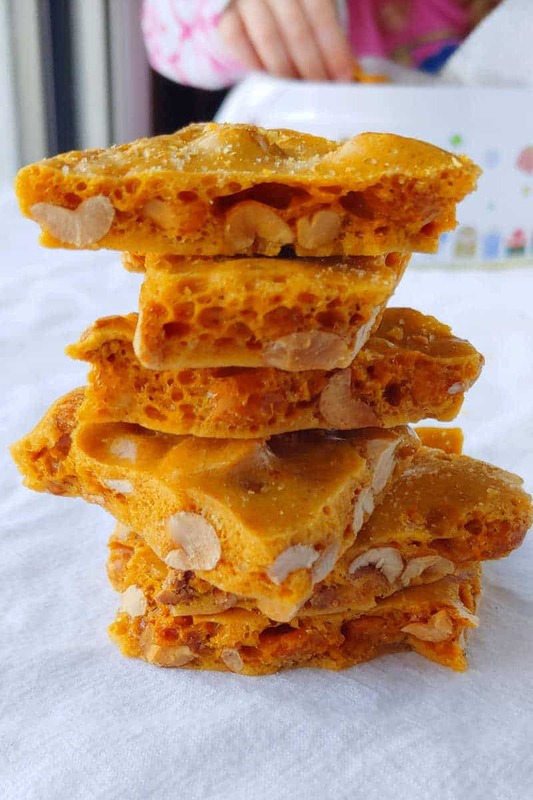 Peanut brittle ships well and stays good for a long time. Some peanut brittle is incredibly hard to bite through. Not this one! It’s crunchy but not hard, and is a little sandy when you chew it. It’s very sweet, of course, but it also tastes richer and more balanced than most other brittles I’ve tried. The sweetness is tempered by the peanuts and a sprinkling of salt on top of the candy. 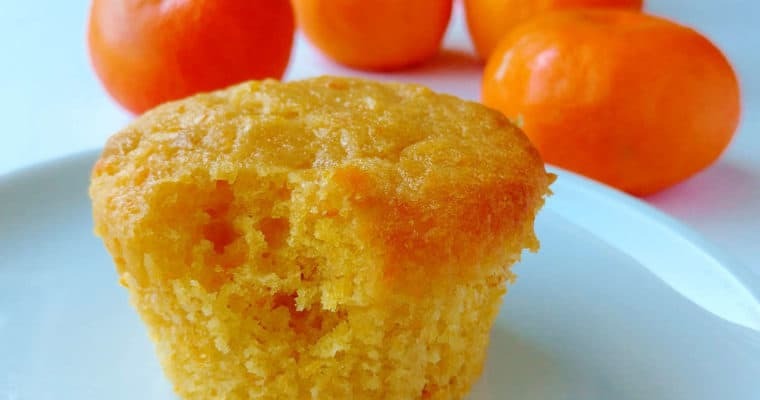 Plus, it takes only 6 ingredients and less than 20 minutes to make! 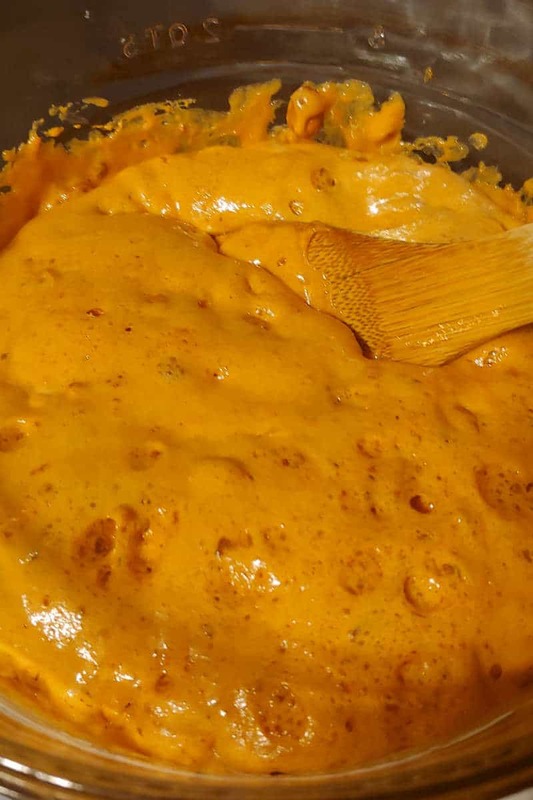 Why Make Peanut Brittle in the Microwave? I’ve made peanut brittle on the stove before (both as a part of my 365 recipe challenge, and even before that), and it’s hard work. Making it in the microwave is so much easier! When I made Old-Fashioned Peanut Brittle from Epicurious 8 years ago, the recipe took over an hour to make! This microwave peanut brittle takes less than 20 minutes. 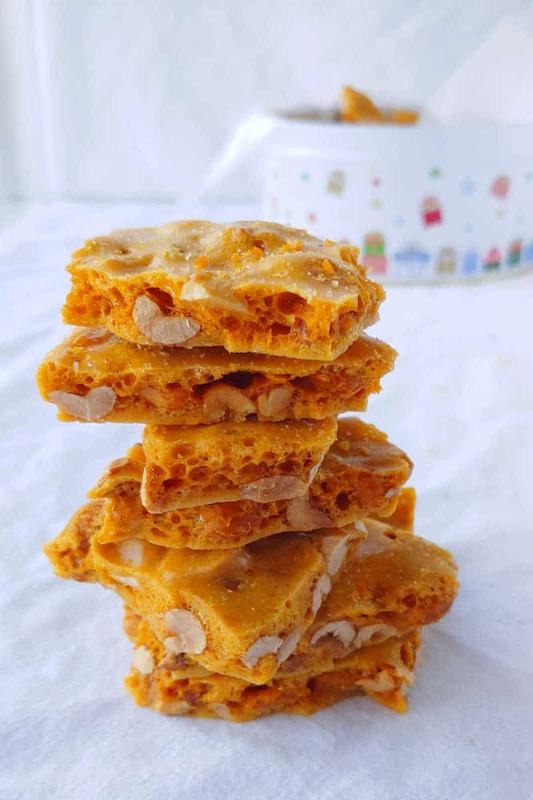 You don’t need a candy thermometer (affiliate link) to make peanut brittle in the microwave! I really like my thermometer, and it’s essential for making candy like homemade marshmallows (which I make 4 batches of each year). But it’s also nice to have a candy recipe that doesn’t use one. You can make peanut brittle on the stove without a thermometer, but you have to watch how your sugar browns and caramelizes extremely carefully. Every time I tried to make a batch of stove-top brittle without a thermometer, I always burned at least 1 batch of sugar. Candy-making can be time-consuming and prone to failure, but I’ve never had this microwave recipe fail on me. Is Making Peanut Brittle from Scratch Worth It? 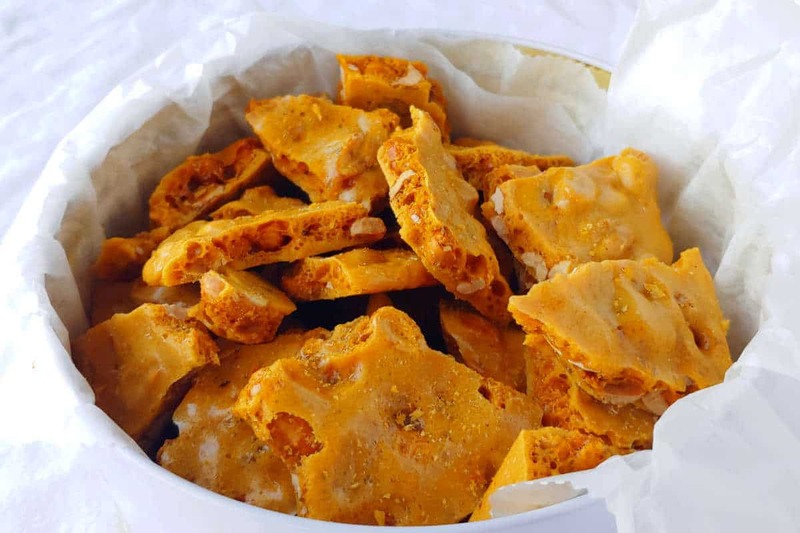 It’s absolutely worth 20 minutes of your time to make your own homemade peanut brittle. I don’t eat peanut brittle except for what I make. 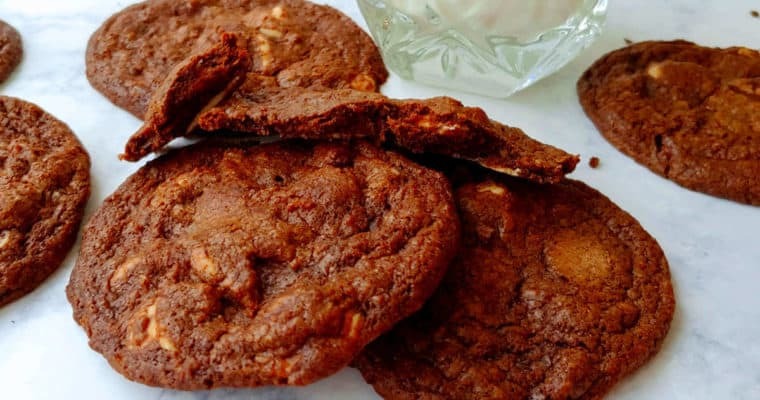 Homemade brittle is so much better! 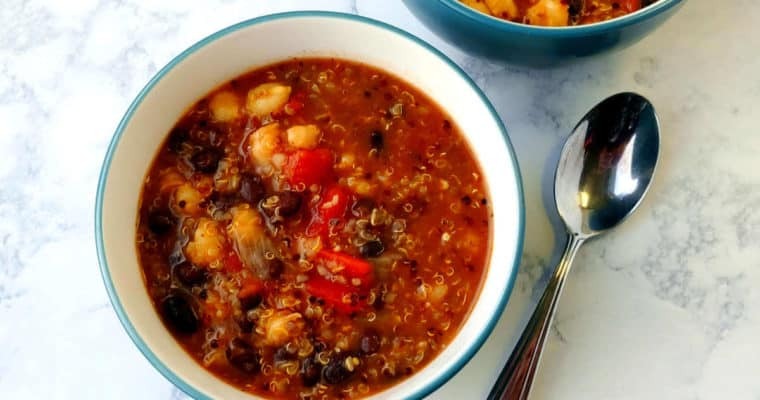 In the 4 years I’ve been making and sending this to friends and family, I’ve gotten many compliments on, and requests for, the recipe. It’s a great homemade gift. Plus, when you make peanut brittle at home, you can customize it! 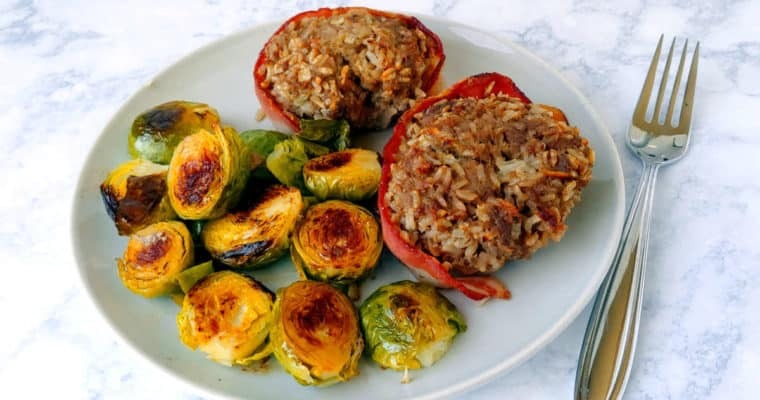 Use almonds or other nuts, add spices, or top with chocolate chips! 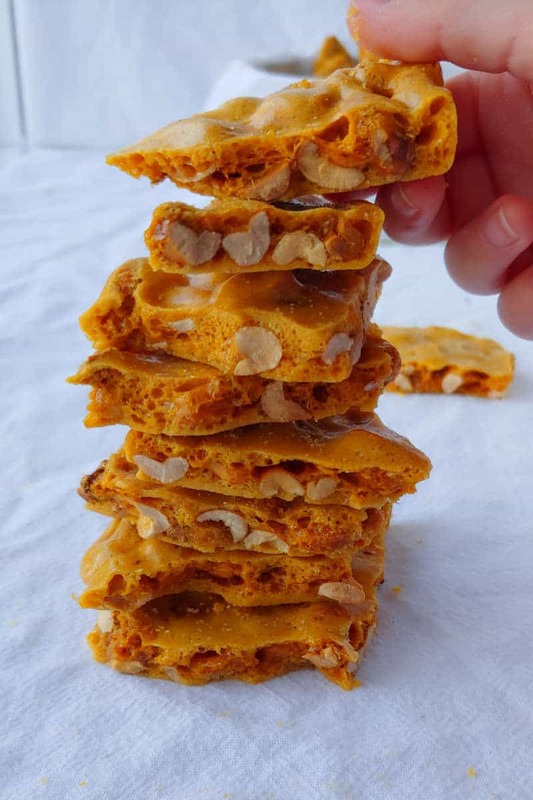 I originally found this recipe for Microwave Peanut Brittle via King Arthur Flour 4 years ago. It was a perfect recipe for me to make to gift at the end of 2014, after we moved to New Jersey, while I was pregnant, and while I was trying to finish up my 50 Weeks of Bread challenge. 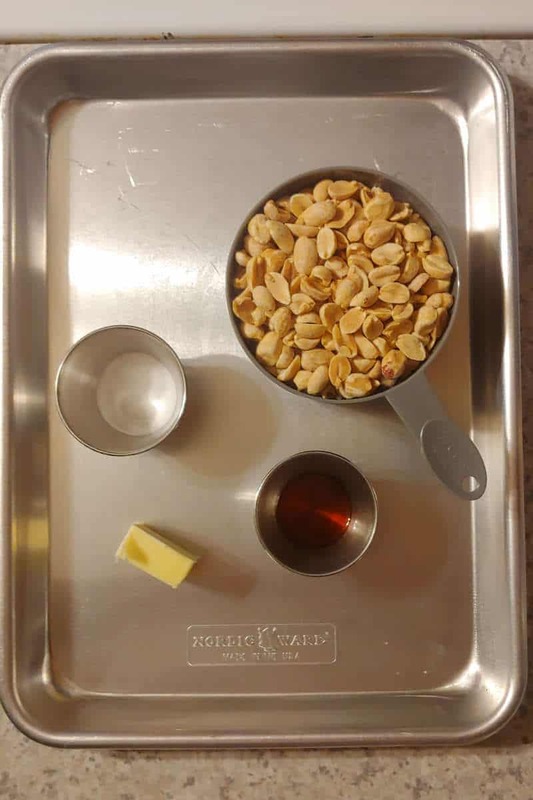 First step in making peanut brittle is to get all of your ingredients measured and your items into place. I don’t often do mise en place, but this candy takes only 15-20 minutes to make, and it’s all active time. You’ll be watching the microwave and won’t be able to do anything else. So, gather your sugar and corn syrup. 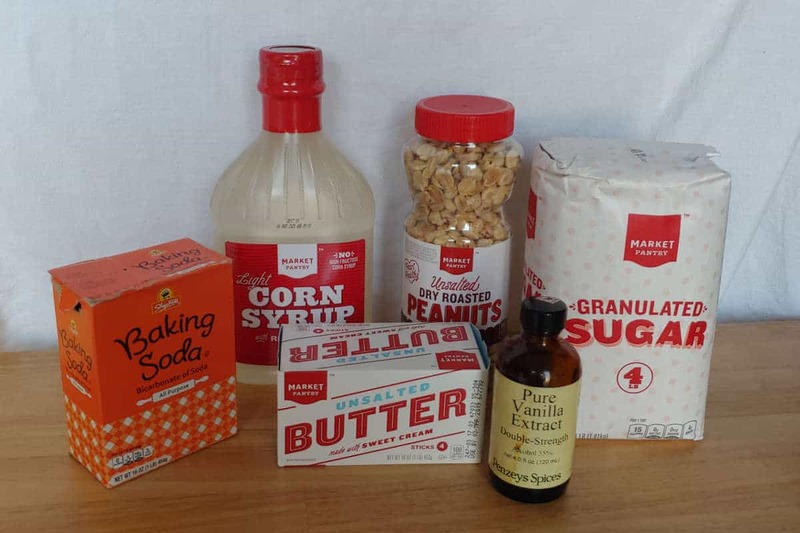 Measure out your butter, peanuts, vanilla, and baking soda. Oil or butter your baking sheet and a wooden spoon to stir with. With a regular spoon, stir together sugar and corn syrup in a large, tall microwave-safe bowl. (I somehow forgot to stir it together once, and the corn syrup on top burned when I microwaved it. Be sure to stir!) This mixture should take up no more than 1/3 of the bowl. The bowl needs to be tall because the baking soda you add at the end will make the mixture foam up. You need to see the color change, so glass is best. I have an 8 cup glass measuring cup (affiliate link) or bowl from Anchor Hocking that I got from my great-grandma’s house. 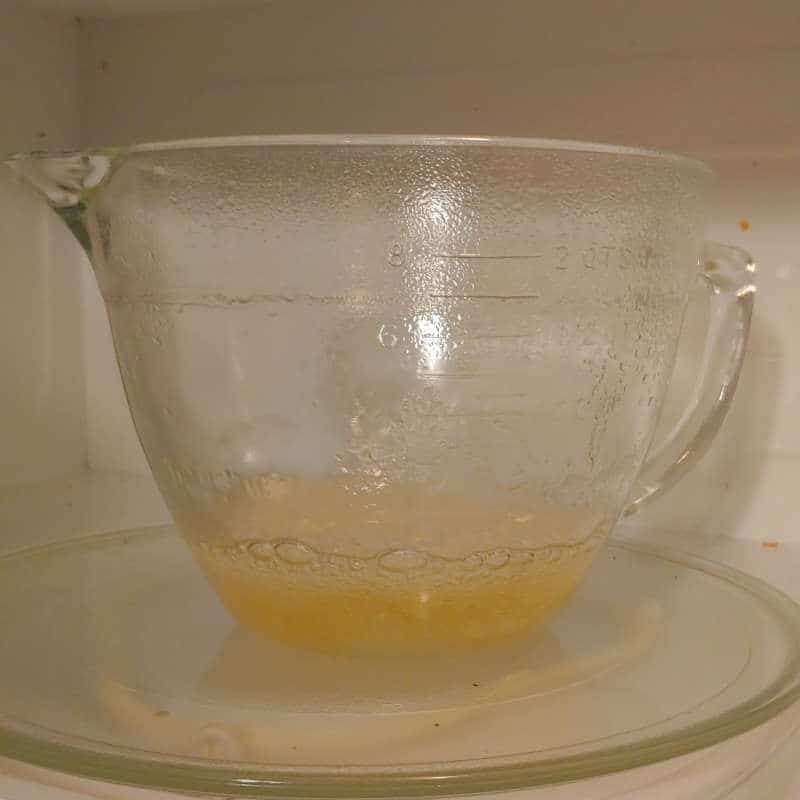 Microwave the sugar/corn syrup mixture on high for 5 minutes. Be sure you have all your remaining ingredients nearby. Spray the baking sheet and wooden spoon while the mixture cooks. Add the butter and the peanuts. Stir to combine with the greased wooden spoon. Microwave for another 2-4 minutes, until the mixture turns a golden brown; my microwave consistently takes 3 minutes. How long this will take will depend on your microwave. My microwave is 1000W; your microwave’s wattage may be different. Err on the side of the mixture being too light; you don’t want it to burn. I prefer it a little lighter than the picture below. Remove the bowl from the microwave. Pour in the vanilla, then the baking soda. Stir well to combine with the greased wooden spoon. The mixture will foam up dramatically. The peanut brittle will cool and harden very quickly. So, working quickly, scrape the peanut brittle into the greased baking sheet. Spread it out to the edges as much as possible, but try not to scrape the top or flatten it. You don’t want to deflate all the bubbles that give the peanut brittle a nice airiness. The pan will be hot, so hold the pan with a glove or towel and gently shake side to side to spread out the brittle. Immediately sprinkle with salt, particularly if you used unsalted peanuts like I do. Let the peanut brittle cool for 30-60 minutes, then break into pieces. I usually only make this at Christmas, so I store mine in a tin, or maybe a glass jar. If your mixture burns, it’s disappointing, but you’re only out a little corn syrup, sugar, and time. Let the bowl cool, then add water to it. 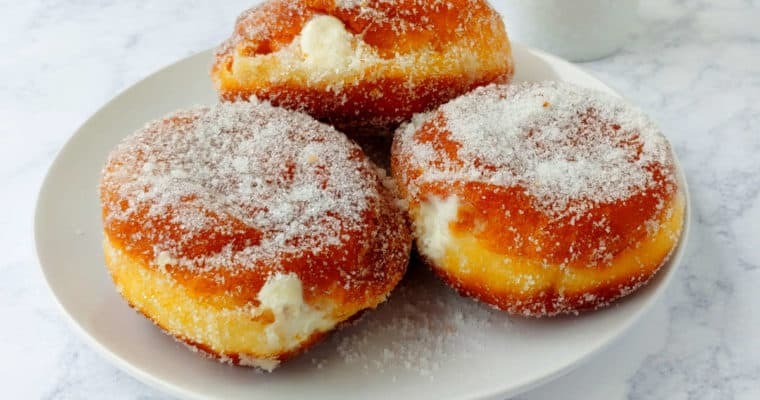 Water dissolves the burnt sugar better than any cleanser does. 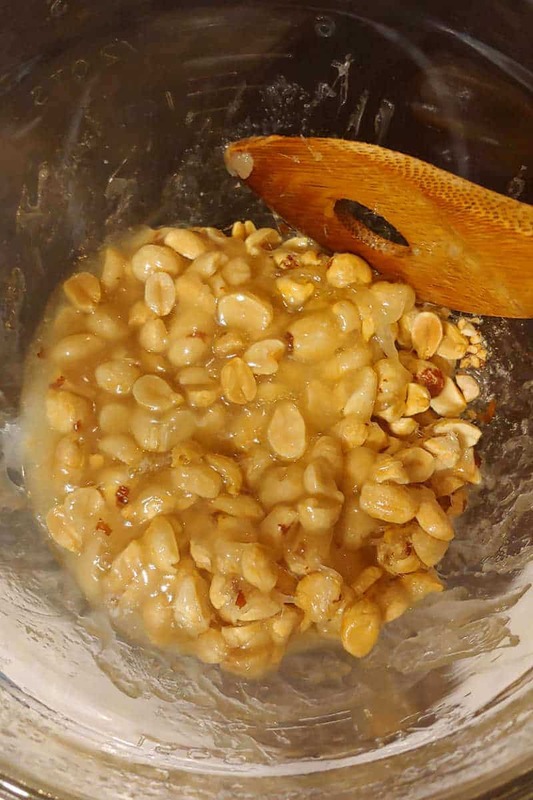 If you get peanut brittle on any other surfaces (the microwave or counters), just rub with plain water until the sugar dissolves. Again, cleanser doesn’t work very well. If you get syrup on yourself while you make the brittle, rinse under cold water immediately. Traditional peanut brittle can cook up to 290F, so it can burn you. Want more treats to give to friends or family as gifts? Check out my post on DIY Food Gifts. Want to make more candy? Try Homemade Marshmallows, which do cook on the stove but are much better than store-bought! 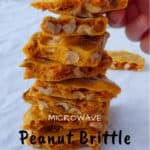 This delicious and easy microwave peanut brittle takes just 6 ingredients and less than 20 minutes! So much better than store-bought! 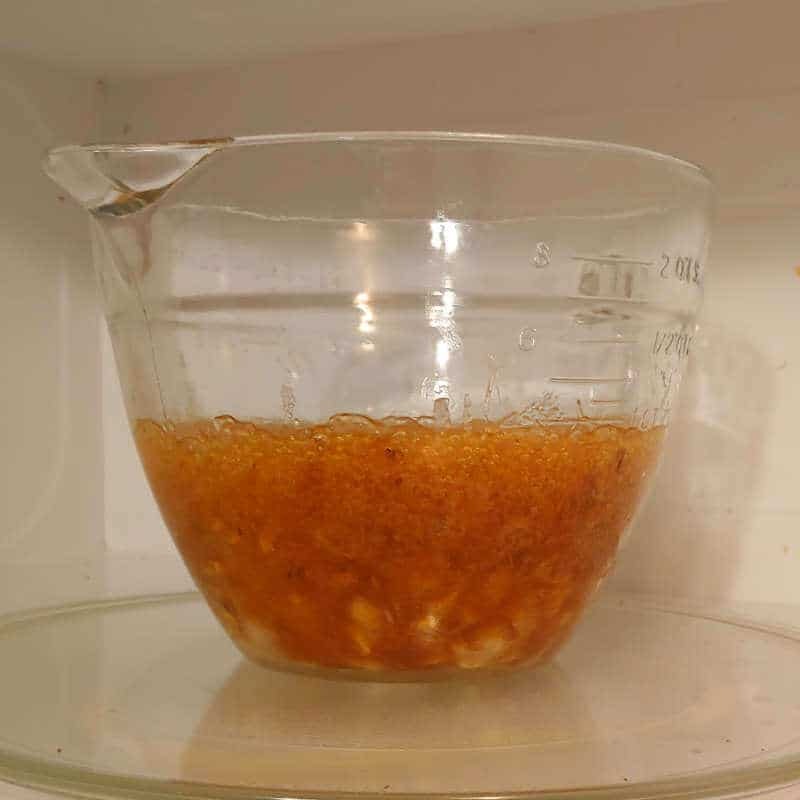 Stir to combine sugar and corn syrup in a large, tall microwave-safe bowl. A glass bowl works best. I used an 8-cup glass measuring cup. The mixture should fill no more than 1/3 of the bowl. While the mixture microwaves, spray a baking sheet with cooking spray or line with parchment. Spray a wooden spoon or spatula for stirring and spreading. Also, make sure the rest of your ingredients are in place. Add peanuts and butter to the sugar mixture, then stir to combine well. Microwave bowl again on high for 2-4 minutes, until the mixture reaches a caramel color - a golden brown. This time will vary depending on the power of your microwave. Mine was ready at 3 minutes. Err on the side of too light than too dark. Add baking soda and vanilla and stir vigorously. The mixture will foam up. Quickly pour the candy onto the greased sheet. Spread the candy out as evenly as possible. Shake the pan gently to spread it out, so that you don't smooth out any bubbles. Sprinkle with salt if you used unsalted peanuts. Let cool completely (30-60 minutes) before breaking into pieces. Store in an air-tight container. Candy cooks quickly, so prepare all your ingredients before you start. The peanut brittle cooks quickly, and hardens quickly once cooked. Grease your pan and wooden spoon well. If you're having trouble seeing your candy as it microwaves, try turning off your kitchen light so you can see into the microwave more easily.